Each celestial body, in fact each and every atom, produces a particular sound on account of its movement, its rhythm or vibration. All these sounds and vibrations form a universal harmony in which each element, while having it’s own function and character, contributes to the whole. Rosacea is the body's response to its inner fire, flame, an inflammatory condition. It is to be understood from all that the body is exposed to, ingests, experiences. A recent development of this condition and a significant flareup showing itself as bright red patches on each cheek, the right more intensely red than the left, lines and blotches of red on the forehead, as well as the reddening of the whites of the eyes, prompted a consultation to explore contributing factors. The body, the mind, the spirit, is ever in response, to what one is exposed to, what one ingests, what one thinks, how one perceives stress and stress response mechanisms. An energetic evaluation identified the particular energy centers that called for attention. Issues associated with each of the energy centers were explored. An opportunity to 'confront' the consciousness associated with these issues was provided. 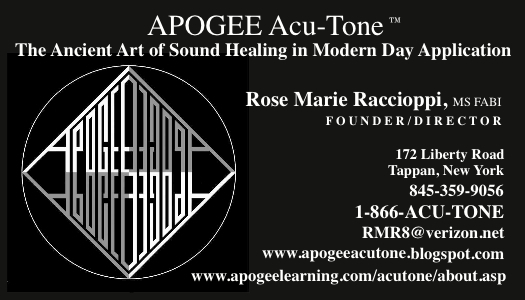 Restorative Frequencies were furnished via the APOGEE Acu-Tone™ Paradigm of Sound/Vibrational Therapy. During and following APOGEE Acu-Tone™ Restorative Frequency application, the intensity of the reddening was significantly reduced. Concomitant statements of feeling, 'relaxed', "calmer," "less tense." "not as anxious," were initiated by the recipient. It was reported during a call to the recipient the following morning, "the improvement is certainly there," "the redness is really reduced," " "feeling better..."
The body in its myriad of ways calls out for our attention. Be it with pain, fatigue, anxiety, inflammation, perceived stress, ill health and disease. We are to be responsive to its call and the nature of its signaling. We are to decode the physical, the environmental, the attitudinal, the very consciousness that brings one to its particular state of BEING. This decoding is what The APOGEE Acu-Tone Paradigm™ offers to those who seek the wisdom of SELF, and are willing to be responsive to the axioms of well being.